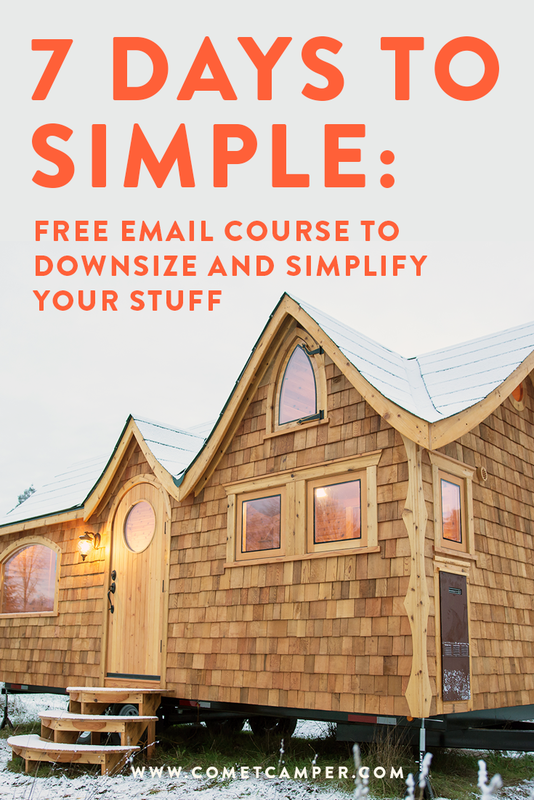 With our free email course "7 Days to Simple"
Whether you ultimately want to end up in a tiny home, living the RV lifestyle, or traveling in your cozy van, the first step is downsizing. This free email course will show you how to start the downsizing process in easy to follow, simple lessons. You can start downsizing right where you are, wherever you are. The 7-Step Framework for Simplifying “Stuff”: There are a few main components of learning how to let go, we’ll walk you through an overview of the whole downsizing process. What’s your why? The first step is getting crystal clear on why you want to downsize. When times get tough or you feel overwhelmed, you’ll come back to your “big why” to get the motivation to keep downsizing! The 5 Easiest Things To Downsize: First you’ll get some momentum by getting rid of the low hanging fruit in your home before diving into the hard stuff. 5 reasons you hold onto stuff you don’t even like, love, or use (and what to do instead): We dive into the emotional reasons you might be holding onto your stuff, and how to overcome these challenges. Meet Others Just Like You: Hear from real people who have gone before you and conquered their clutter, downsizing successfully despite the challenges. The 3 Biggest Mistakes To Avoid When Downsizing: It’s important to know what the roadblocks are and the most common mistakes we see people making when they try to downsize to go tiny, and how to avoid them! The Next Step: You’re off to a great start, but it’s time to take the next step in your journey. We’ll show you how to get step by step help throughout the downsizing process! Don’t try to go tiny without going through this free course first! Even if your tiny living dream is a few years away, you can start the journey today with this free course. Don't wait until you're ready to move into your tiny space to start this lifelong journey to a simpler life!